Peter Straub’s Ghost Story is an interesting story, but I did have a difficult time sticking with it. There were times I felt it was intriguing, others when it was a bit boring, and some times when I thought it was awesome. A big part of the story I really enjoyed is the twist. Though the story begins with a group of friends telling ghost stories to one another, the antagonist turns out to be a shape-shifting creature, and this was something I didn’t expect to happen during my reading. The twist plays with what we expect and what we don’t, in both life and stories. “Hauntings” have become so popular in literature and culture that they have almost become cliché. 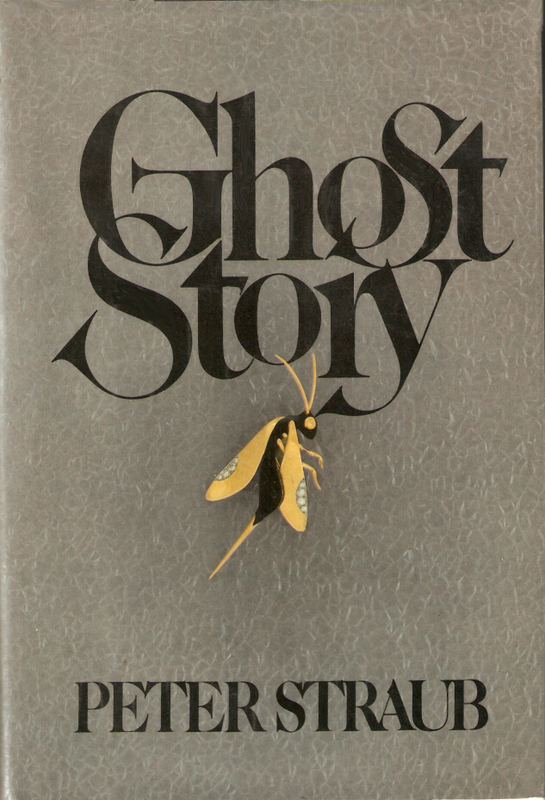 With Ghost Story, the reader is thrown into a familiar world, that is, a haunted world; however, as the book progresses, the familiar soon becomes unfamiliar as a creature relatively unknown to our culture in the US–unless the reader knows Native American legends and creatures to some degree–is revealed to be the force behind all evil in the story. The sudden push into the unknown can produce a feeling of unease in the reader, something which can help involve him or her in the emotional atmosphere of the characters and their world. Another aspect of the story I found great is the lack of containment for the monster; the Manitou is not a ghost that is chained to a certain place or person. It is free to “haunt” whomever she chooses, which makes the creature much more frightening than a ghost. I would even go as far to say it can be more frightening than even a demon, as a demon must obey certain rules, in many stories anyways, such as an aversion towards holy objects, holy water, or even in the way a demon can be exorcised. When it comes to the Manitou, new rules must be figured out because of the unfamiliarity with creatures like this. The men in the story may deserve the “hauntings” they so encounter because of what they attempted to do in their pasts, that is, Eva Galli is believed to be dead, so they conspire to hide her body rather than face whatever may happen should they tell the authorities. They end up being haunted by both the Manitou and their own pasts, which exacerbates their personal fears, and helps establish the atmosphere of the book. We all have something in our pasts that we may not want to come to light, no matter how insignificant they truly may be. The sins we hide may not even come close to the severity of trying to hide a body, but they still haunt us. In the case of the book and for the Chowder Society, they may deserve the Manitou because of how bad their sins are. Ghost Story is a good book, one that I enjoyed at times, and although it may never take a place on my favorites shelf, it is worth the read, especially if just to examine how Straub transforms the familiar into the unfamiliar, which is something all of us horror authors should be able to do every now and the, preferably in every story.